Why bother with education if I’m just selling books? Just saying… how hard can it be? My experience with CABS and Rare Book School. What do we do with our Collections and/or Stock? In the beginning, along with a full van of books and hope, there were also packed lunches. We were newbies to the tradeshow circuit. By packing our lunches, we did not have to worry from whence the sustenance would come. Besides, we did not want to spend the time or the money for outside food. Whenever we got hungry we would reach under the tablecloth and the cooler would come out. 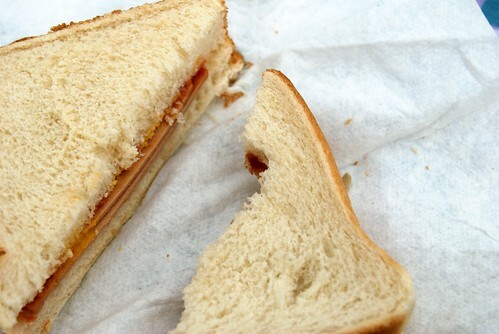 Bologna or ham sandwiches were the norm – we would sometimes spruce it up and add lettuce and mustard. It had to be something we could hold with our hands and not be too messy. One of us would eat and the other would continue the customer service. We wised up. John wanted something hot – which never comes out of a cooler. Sonia wanted to try new things, especially in foodie towns like New York City or Washington, DC. Bologna sandwiches no longer cut it. Now, we research ahead of time – cheap eats, reviews with kudos – anything and everything we need to know to get a good meal. Yes, there have been times when we have lamented spending good money on mediocre food, but we rarely miss the bologna. We’ve even started going to dinner with friends and colleagues after the show and during setup. The costs are far outweighed by the fun, collegial atmosphere over food and the occasional drink. For the Brooklyn Antiques and Book Fair in Greenpoint (Brooklyn), NY, besides the Milk Truck grilled cheese option, we have already scoped out possible eateries close to the venue. Peter Pan donuts as we mentioned before – yes, donuts can be a meal by themselves. There are also great reviews for Pauli Gee‘s (pizza) 2 1/2 blocks away; Calexico (Mexican); Five Leaves (eclectic) or something more old fashioned like Lomzynianka (Polish). How do we find all these potential meals? We ‘google’ them. We search for “cheap eats Greenpoint NY”; “best restaurants Brooklyn NY”; etc. Or we use www.tripadvisor.com. But most importantly, we cross-reference. Rated #1 Chinese for a small town will not be the same as Rated #1 Chinese for Boston, MA. Don’t forget to read the comments. We will see if there is time for all those restaurants. Unfortunately, there are only three meals a day, although in Lord of the Rings, there is also second breakfast. © 2017 Kuenzig Books. All rights reserved.